"If ever there was a filmmaker to come up with a Theory of Everything, it's Marker." "Chris Marker, the most poetic and original of documentarists." Born Christian François Bouche-Villeneuve on July 29, 1921 in Neuilly-sur-Seine, France, Chris Marker was a cinematic essayist and audio-visual poet. After the Second World War, Marker began as a writer, publishing his first book in 1949. In the 1950s he turned to documentary filmmaking. Among his classic works from this period are Letter from Siberia, Cuba Si!, Le Joli Mai, and La Jetée. In the '60s and '70s he was actively involved with SLON, a filmmaking collective dedicated to activist production. 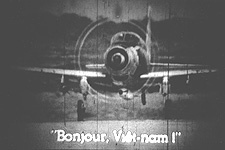 Marker reemerged to make films under his own name again in 1977 with Le Fond de l'air est rouge (English title: A Grin Without A Cat). Creatively reworking his life as if editing one of his own films, Marker made films on other filmmakers during the '80s and '90s, including the renowned One Day in the Life of Andrei Arsenevich. He also explored video and computer-generated imagery with a continued emphasis on the intersection between personal and political themes in films such as The Case of the Grinning Cat, which was released in English in 2006. A pioneer auteur filmmaker and an original voice in world cinema for over 50 years, Marker passed away on his birthday, July 29, 2012. He is widely accepted to be one of the most innovative and influential filmmakers in modern cinema history. Icarus Films is proud to distribute over 10 of Chris Marker's films, plus his Bestiary, a collection of his short animal films, as well as Far From Vietnam and Class of Struggle—two collaborative productions that he helped initiate. Icarus Films also distributes two films about Marker's legacy: Dan Geva's Description of a Memory, a film Marker appreciated being shown alongside with his work, which examines the history of Israel through the lens of Marker's own 1960 film Description of a Struggle, and To Chris Marker, An Unsent Letter, a posthumous homage by Emiko Omori. The Case of the Grinning Cat (2004) - In his newest film, French cinema-essayist Chris Marker reflects on French and international politics, art and culture at the start of the new millennium. Remembrance of Things to Come (2001) - Reminiscent of Resnais, Ivens, even Kubrick, but in its deployment of still photographs (as in La Jetée), its theme of history and memory, its subject-skipping montage and rapid shuttle of wit and philosophy it's pure Marker. One Day in the Life of Andrei Arsenevich (1999) - Marker's homage to his friend and colleague, Andrei Tarkovsky. A unique and intimate portrait of the legendary Russian filmmaker. Level Five (1996) - A woman "inherits" a task: to finish writing a video game centered on the Battle of Okinawa. Chris Marker's Bestiary (1994) - Five Chris Marker short films devoted to animals collected together and available for the first time! The Last Bolshevik (1993) - Marker's tribute to Russian film director Alexander Medvedkin. The Owl's Legacy (1989) - Chris Marker takes thirteen words of Greek origin that cover an array of subjects in order to find the ancient Greece that accompanies our thoughts, inspires our writers, influences our politics and ideals of beauty. A Grin Without A Cat (1977) - Marker's epic film-essay on the worldwide political wars of the 60's and 70's: Vietnam, Che, May '68, Prague, Chile, and the fate of the New Left. The Embassy (1973) - In one of Chris Marker's few fiction films, political dissidents seek refuge in a foreign embassy after a military coup d'état in an unidentified country. Three Cheers for the Whale (1972) - Noted French documentarian Chris Marker chronicles the history of the whale and, in a more general manner, that of all marine mammals, in the process warning of the imminent destruction of the whale threatened by the fishing industry's ongoing slaughter. Class of Struggle (1969) - Workers at the Yema Watch Factory in Besançon depict their own labor struggles in this collective production initiated by Chris Marker. A bientot, j'espere (1968) - Workers at a textile factory on strike in pre-May '68 France, not just for more money, but for a different way of life. The Sixth Side of The Pentagon (1967) - Chronicle of the 1967 Mobilization to End the War in Vietnam protest march on the Pentagon by documentary essayist Chris Marker. Far from Vietnam (1967) - The landmark collaboration between Jean-Luc Godard, Joris Ivens, William Klein, Claude Lelouch, Chris Marker, Alain Resnais and Agnés Varda in protest of the Vietnam war. Le Joli Mai (1963) - Chris Marker and Pierre Lhomme's legendary portrait of Paris and Parisians at the close of the Algerian war. To Chris Marker, An Unsent Letter - A cinematic love letter to filmmaker Chris Marker. Description of A Memory - A multifaceted exploration of Israel's history and its present.